Search traffic analytics is a pattern for implementing a feedback loop for your search service. This pattern describes the necessary data and how to collect it using Application Insights, an industry leader for monitoring services in multiple platforms. Search traffic analytics lets you gain visibility into your search service and unlock insights about your users and their behavior. By having data about what your users choose, it's possible to make decisions that further improve your search experience, and to back off when the results are not what expected. 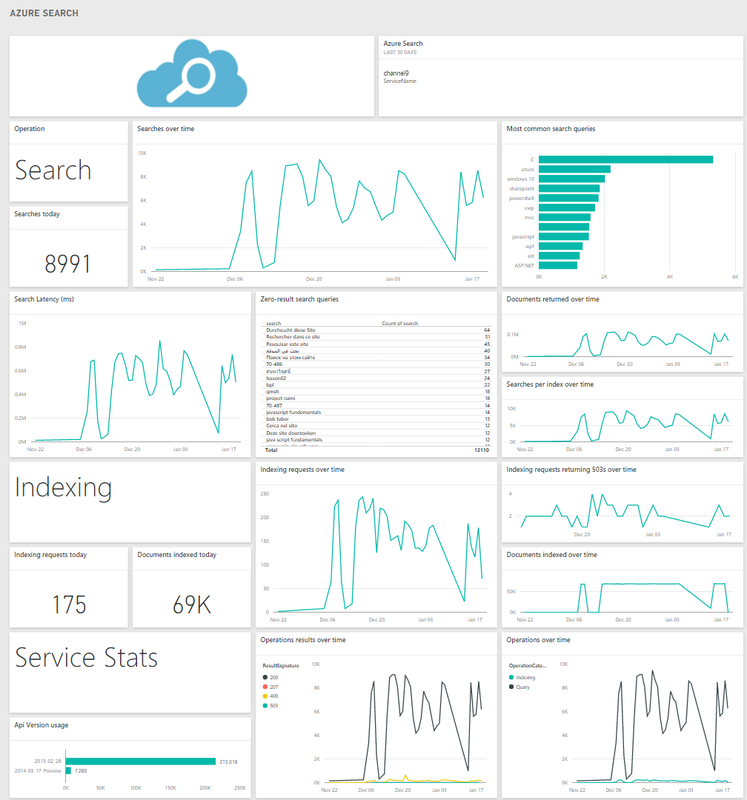 Azure Search offers a telemetry solution that integrates Azure Application Insights and Power BI to provide in-depth monitoring and tracking. Because interaction with Azure Search is only through APIs, the telemetry must be implemented by the developers using search, following the instructions in this page. To have useful search metrics, it's necessary to log some signals from the users of the search application. These signals signify content that users are interested in and that they consider relevant to their needs. User generated search events: only search queries initiated by a user are interesting. Search requests used to populate facets, additional content or any internal information, are not important and they skew and bias your results. User generated click events: By clicks in this document, we refer to a user selecting a particular search result returned from a search query. A click generally means that a document is a relevant result for a specific search query. By linking search and click events with a correlation id, it's possible to analyze the behaviors of users on your application. These search insights are impossible to obtain with only search traffic logs. The signals mentioned in the preceding section must be gathered from the search application as the user interacts with it. Application Insights is an extensible monitoring solution, available for multiple platforms, with flexible instrumentation options. Usage of Application Insights lets you take advantage of the Power BI search reports created by Azure Search to make the analysis of data easier. In the portal page for your Azure Search service, the Search Traffic Analytics blade contains a cheat sheet for following this telemetry pattern. You can also select or create an Application Insights resource, and see the necessary data, all in one place. You need to select an Application Insights resource to use or create one if you don't have one already. You can use a resource that's already in use to log the required custom events. When creating a new Application Insights resource, all application types are valid for this scenario. Select the one that best fits the platform you are using. You need the instrumentation key for creating the telemetry client for your application. You can get it from the Application Insights portal dashboard, or you can get it from the Search Traffic Analytics page, selecting the instance you want to use. Step 1: Create a telemetry client This is the object that sends events to the Application Insights Resource. For other languages and platforms, see the complete list. Remember to only log search queries that are generated by users. Position refers to the cardinal order in your application. You are free to set this number, as long as it's always the same, to allow for comparison. 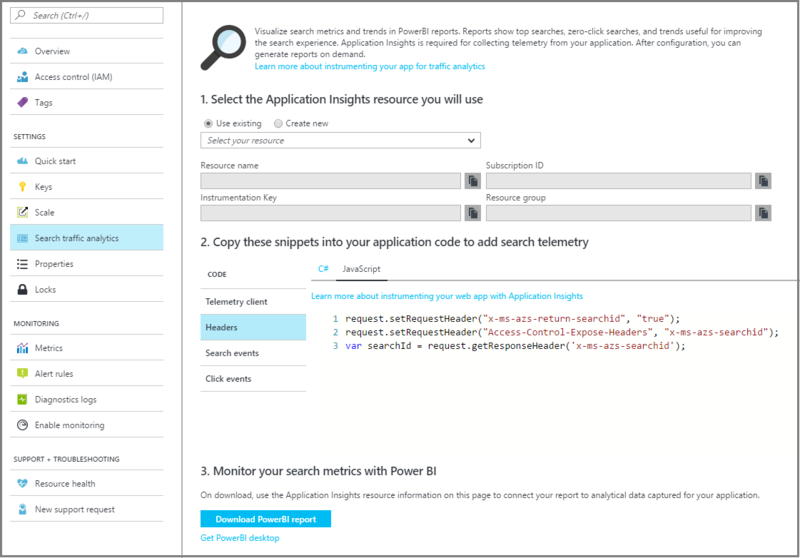 After you have instrumented your app and verified your application is correctly connected to Application Insights, you can use a predefined template created by Azure Search for Power BI desktop. Azure search provides a monitoring Power BI Content Pack so that you can analyze log data. T The content pack adds predefined charts and tables useful for analyzing the additional data captured for search traffic analytics. For more information, see the content pack help page. In the Azure Search dashboard left-navigation pane, under Settings, click Search traffic analytics. On the Search traffic analytics page, in step 3, click Get Power BI Desktop to install Power BI. On the same page, click Download PowerBI report. The report opens in Power BI Desktop, and you are prompted to connect to Application Insights. You can find this information in the Azure portal pages for you Application Insights resource. The report contains charts and tables that help you make more informed decisions to improve your search performance and relevance. Click through Rate (CTR): ratio of users who click on a specific document to the number of total searches. Most clicked documents: most clicked documents by ID in the last 24 hours, 7 days, and 30 days. Popular term-document pairs: terms that result in the same document clicked, ordered by clicks. The following screenshot shows the built-in reports and charts for analyzing search traffic analytics. Instrument your search application to get powerful and insightful data about your search service. You can find more information on Application Insights and visit the pricing page to learn more about their different service tiers.